The MGM production of the Learner and Lowe musical Brigadoon (1954) is a mixed bag, overwhelmed by inelegant artifice, but not without its moments of misty magic. Cyd Charisse, Gene Kelly and Van Johnson lead a pleasantly quirky cast, directed by Vincente Minnelli. The film is now available on Blu-ray from Warner Archive, with the welcome addition of three musical numbers from the show, that were edited from the final cut, in the special features. Kelly and Johnson play a pair of American tourists who are in the midst of an unsuccessful hunting trip in the Scottish highlands. They come upon a curiously old-fashioned village, which they learn comes to life one day every century. They have arrived on the day of a wedding and become involved in all the drama and romance that entails. 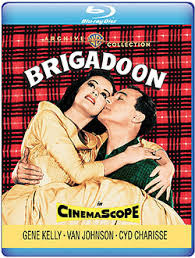 As MGM's baseline was uniformly high during its musical heyday, Brigadoon has much going for it. Minnelli captures a dreamy, romantic mood, the cast is vibrant and jolly, and the musical numbers are executed with slick efficiency. It doesn’t always keep a steady momentum, but it moves well enough. 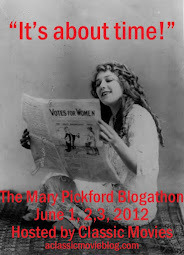 However, this screen adaptation of the Broadway sensation never quite finds its heart. As beautiful as it can be, it never feels as lush as it should. This is primarily due to studio insistence that the film be made on a soundstage instead of the outdoor locations it clearly needs to work as cinema. It is hard to enjoy Kelly and Charisse swooping around plaster rocks and painted backdrops when you know how magical it would be in the open air. Kathryn Grayson was originally cast to play Charisse's role, and if she had, perhaps the musical would have been more focused on its strong point: the gorgeous score. Though it has its acrobatic moments, Brigadoon is best as a singing show. Though it was logical to bring more dance numbers into the production with Charisse and Kelly as leads, it doesn’t suit the spirit of of the production. Watching Johnson and Kelly break into a tap number in an otherworldly Scottish village gives you the feeling they have dropped into the wrong film. While Minnelli for the most part films his cast to advantage, his staging of the musical numbers lacks impact. Too often he goes for a wide shot filled with rocks, trees and fake heather, making you work to focus on the players stranded in the middle of the screen. The moments in the score that should hit you with swelling emotion get lost, slipping away without payoff. Part of this is also due to the cast, which with its dancing focus simply can’t do justice to the swooning romance of the score. It might have worked better on the soundstage if it had featured artists who could have mined the music for its full emotional impact: like Kathryn Grayson or Jane Powell singing in close-up with Howard Keel. It could have been magical if they’d been able to film that kind of combination on location. Charisse and Kelly have their swoony moments though, even if they aren’t entirely suited to the material. Brigadoon should satisfy those who enjoy the pair together. Johnson is also enjoyably prickly, taking his cheerful young man persona in an interesting direction. I always thought it was a shame that the tender Come to Me, Bend to Me didn’t make it into the film and was thrilled to see the outtake for that number in the special features. Also included are From This Day On, Sword Dance and an audio outtake for There but for You Go I. The Blu-ray image quality is solid, capturing the rich colors of the production.